Prolonged or high intensity visible light exposure leads to photoreceptor cell damage and loss by incompletely understood mechanisms. In the rat retina, the sequence of events associated with intense light damage is triggered by the bleaching of rhodopsin (1), and the extent of damage is modulated by other photoreceptor cell proteins involved in visual transduction (2). Thus, environmental light-rearing conditions that alter the steady state levels of rhodopsin, α-transducin and s-antigen (arrestin) can affect the ultimate fate of visual cells (2,3). 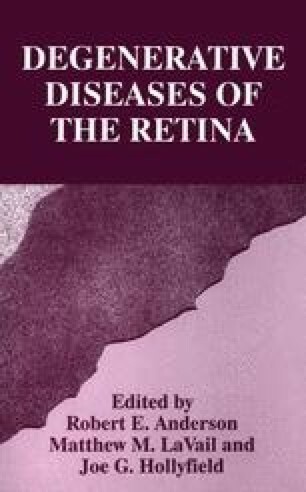 However, irrespective of their prior light-rearing environment, when rats are pretreated with natural or synthetic antioxidants, retinal light damage is less than in unsupplemented animals (4–8). This indicates that intense light exposure also results in oxidative reactions within the photoreceptor cell.